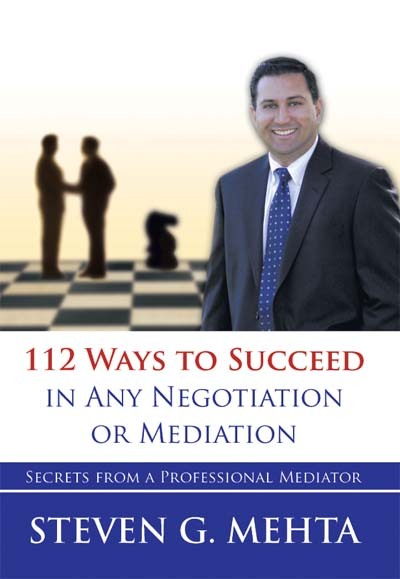 I'm Steven G. Mehta, author of 112 Ways to Succeed in Any Negotiation or Mediation: Secrets from a Professional Mediator. I have been successfully mediating complex cases since 1999. I have been repeatedly selected by attorneys as a "SuperLawyer" in the field of mediation and as one of the "Best Lawyers in America" in the field of mediation. This is my second book (being a co-author of a book) and my first book exclusively on negotiating. Everybody negotiates, even if they don't realize it. The problem is that most people don't know how to negotiate effectively. In this book, you will learn powerful techniques that have been successfully used in real-world negotiations to get the maximum results in any negotiation. 112 Ways to Succeed in Any Negotiation or Mediation will turbo-charge your negotiating skills regardless of your experience and will help to put more dollars in your pockets because you will make better deals. • Ten most common mistakes made in negotiations.